Steve Gadd's "Live at Voce"
Last November, Gadd brought an all star line-up to Yoshi's in San Francisco with keyboardist Joey DeFrancesco, saxophonist Ronnie Cuber and guitarist Paul Bollenback. Now comes a live album featuring that band, "Live at Voce". A well-respected drummer who has appeared in many types of settings in many genres, Gadd's impressive technique and flexibility have been influential during the past 20 years. He started playing drums at the age of three, sat in with Dizzy Gillespie when he was 11, and after extensive study and a stint in the Army, Gadd became an important studio drummer beginning in 1972. Among his more significant jazz associations have been with Chick Corea (starting in 1975), Bob James, Al DiMeola, Tom Scott, Grover Washington Jr., David Sanborn, the group Stuff, the Manhattan Jazz Quintet, and his own impressive band (the Gadd Gang) which recorded for Columbia in 1986 and 1988. Gadd's website features a review of the aforementioned album, recounted below by Malcolm Moore who wrote, "This has been a simply stellar year for Steve Gadd. 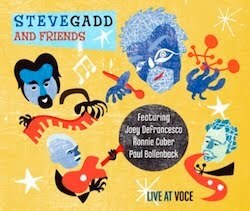 Between tours, recordings, and performances with world renown artists such as Eric Clapton, James Taylor, Alain Clark, and Edie Brickell, he somehow also managed to record and produce 3 albums himself, the first of these being Steve Gadd & Friends "Live at Voce." It’s the debut CD by a band that has actually been touring sporadically since 2007. Steve Gadd & Friends is comprised of Gadd on drums, Joey DeFrancesco on Hammond organ and trumpet (! ), Ronnie Cuber on baritone sax, and Paul Bollenback on guitar. Even though Gadd is a master at all genres, it’s easy to tell that this is the type music he truly enjoys playing the most. The music seems to effortlessly breathe with its deep groves and emotional expressionism. It was recorded at an intimate setting, in Scottsdale Arizona, at Voce’ Lounge. If you listen with headphones on, it’s as if the band is playing right in front of you. You can hear the ambiance of the gig; counting off of the tunes, people cheering, shouting, and clapping, and the clinking of occasional drink glasses. On one hand it’s a nod to the past, as Gadd and Cuber played for many years together in The Gadd Gang. But on the other hand, they’re charting new territory with DeFrancesco taking it into the stratosphere with the Hammond and Bollenback painting the canvas with a fusion that seamlessly glues it all together. The music is immediate and intense. Despite the laid back feel of "Bye Bye Blackbird ", with its hip brush strokes, muted trumpet, dripping guitar phrases, and submarine sax, these four gentlemen are symbiotic, fluid, and cohesive. They conjure up myriad sonic landscapes outside of space and time by dousing the audience with pure musical joy. Gadd always knows when to leave space and just groove, but he also provides some brilliant and dazzling drum solos, too. "Sister Sadie" is a perfect example. What starts out as a blazing strait-ahead tune, with Cuber blowing bolts of lightening, and then Bollenback flailing away into hidden fretboard realms, gradually turns into Gadd trading fierce fours with DeFrancesco. He throws off the snares, picks up the brushes, and then unveils a tribal masterpiece. Just as enjoyable and revealing is his new take on the Gadd Gand classic "Way Back Home." This version is a bit wider, looser, and dirtier, with the raunchy sax and organ screaming back and forth like rabid, territorial jazz cats. Gadd rips into his solo here with the exuberance and finesse of a wise master craftsman. "Them Changes" is a chef d'oeuvre that only seasoned professionals like these four friends could cook up and then actually pull off. It’s an abstract and Barfly-esque study in funk. Twists and turns abound as they speak in music to each other. Their interplay is beatific as the euphoria fills the room. In a time where most music relies on computer enhancements, this is an organic anomaly straight from the source. If this is their debut recording, one can only image what they will do next! Don’t miss out on this astounding new release..."